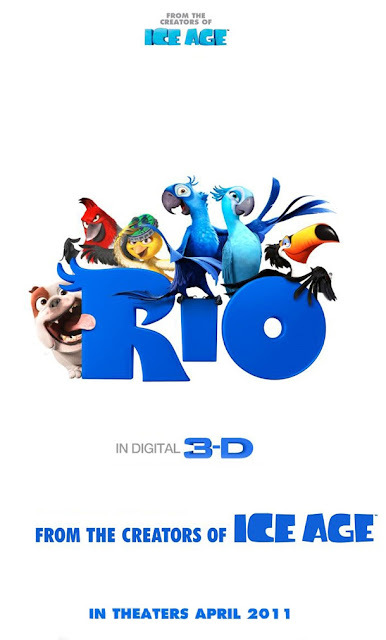 Blu (Jesse Eisenberg) is a rare blue macaw that finds his way via poachers to Minnesota where he is found by a young girl, Linda (Leslie Mann), who promises to take care of him. Years later Linda is a bookstore owner and Blu is so content he never learns to fly. They are visited by an ornithologist named Tulio (Rodrigo Santoro) who tells them that Blu is the last male blue macaw and they must go to Rio to mate with the last female blue macaw, Jewel (Anne Hathaway) in order to save their species. Jewel and Blu are skeptical about leaving Minnesota, but decide to go because "it's the right thing to do". In Rio Blu and Jewel are bird-napped by a band of poachers. They are chained together at the leg and locked in a cage. They waste no time escaping from their captors. They are chased and hunted by the not-so-friendly Cockatoo, Nigel (Jemaine Clement). Throughout they are teamed up with and against various creatures that lend to a fun Love/Rescue story fittingly made for kids. There were plenty of laughs for young and old alike, thanks to the talents of the likes of George Lopez, Tracy Morgan, Will.I.Am, and Jamie Foxx and if you don't expect Shakespeare from a 90 minute C/G movie I trust you will find it quite entertaining. I felt that some of the Carnivale costumes portrayed in the movie, while probably accurate, were a little much for the rated G crowd, but not ridiculously so. The humor was appropriate for any age and the C/G was remarkable, which has become expected at this stage of C/G. I'm still not a huge fan of 3-D movies, and this one, like the others I've seen, really doesn't have to be seen in 3-D.